This year, California weathered its biggest pertussis – aka "whooping cough" – epidemic in seventy years (for a whopping dose of perspective, see the graph up top). A new report from the CDC says the outbreak could be a sign of things to come. It's true that California's latest pertussis outbreak can be hung, to some extent, on the state's crummy vaccination rates – but a new report from the CDC highlights another pressing problem: Pertussis vaccines just aren't as effective as they used to be. From Jan. 1 through Nov. 26, the state registered 9,935 cases of pertussis, for an incidence of 26.0 cases per 100,000 population, according to investigators with the California Department of Public Health. It's the largest number of cases reported in California in nearly 70 years, the group reported. Infants had the largest burden of disease, but there was also a peak among adolescents 14 through 16 — the age cohort whose members have only had the acellular pertussis vaccine, they reported in the Dec. 5 issue of Morbidity and Mortality Weekly Report. Notably, the peak age of disease incidence beyond infancy increased to age 14–16 years in 2014 compared with the peak among children aged 10 years during the 2010 pertussis epidemic [Ed. : Pertussis outbreaks tend to cycle, peaking every 3–5 years]. Children and teenagers born in the United State since 1997 have only received acellular pertussis vaccine, and the upper age of this cohort correlates with the peak age in incidence during both epidemic years. Data available since the 2010 epidemic indicate that immunity conferred by acellular vaccines, particularly when used for the primary series, wanes more rapidly than that conferred by older, whole-cell vaccines that were used in the United States from the 1940s to the 1990s. Acellular pertussis vaccines are less reactogenic than whole-cell vaccines, but the immunity conferred by them wanes more quickly... It is likely that increased incidence will continue to be observed among this cohort in the absence of a new vaccine or more effective vaccination strategy. 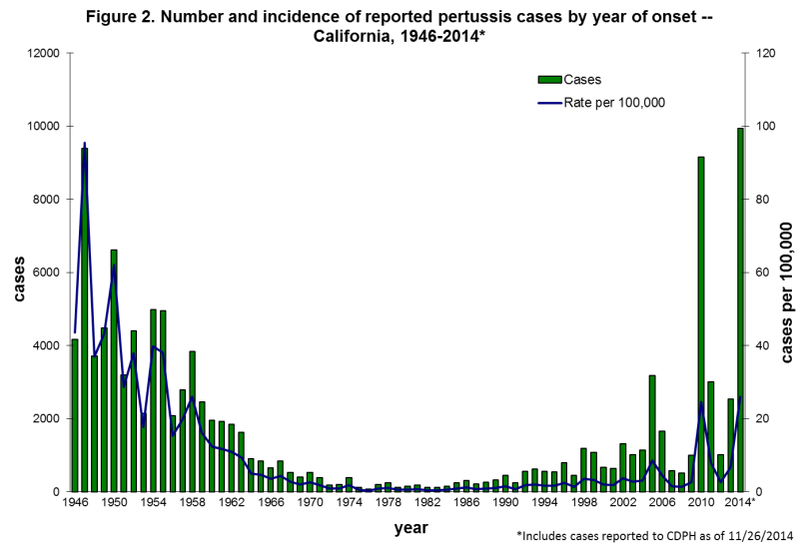 The upshot: The timing and age-distribution of this year's pertussis outbreak in California adds to a growing body of evidence that indicates acellular pertussis just isn't as effective as its whole-cell counterpart. "As long as currently available acellular pertussis vaccines are in use," the report concludes, "it is likely that the 'new normal' will be higher disease incidence throughout pertussis cycles." Protecting a community against pertussis requires that at least 92% of the population be immune. Given the complexities of waning immunity, as well as a weaker pertussis vaccine than was previously used in the United States, maintaining that threshold to achieve "herd immunity" is more critical than ever—especially to protect infants, who are the segment of the population most vulnerable to the disease. Read the CDC's full report here.